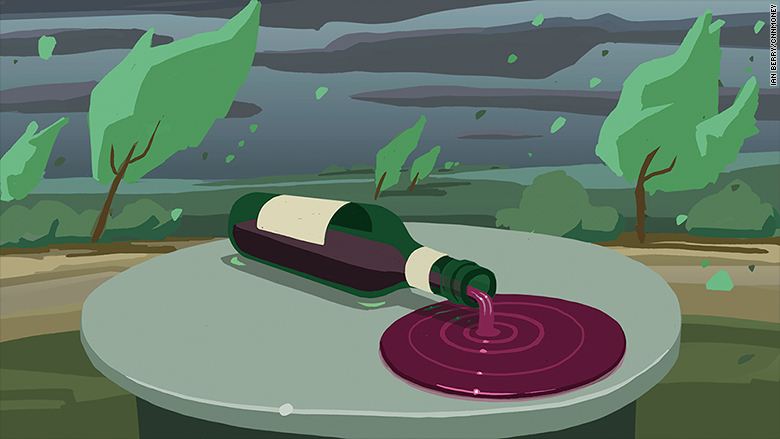 Extreme weather could be putting your favorite bottle of wine at risk. Global wine production is forecast to fall 5% in 2016, making it one of the worst years since the start of the century, according to the International Organization of Vine and Wine (OIV). Wild weather, apparently driven by climate change, is the main culprit for the decline, the wine group says. "With global warming, we're witnessing an increase in exceptional events that are more frequent, longer lasting and of greater scale," Jean-Marie Aurand, the head of the OIV, told Reuters. Huge drops in output are expected this year in key South American nations including Chile and Argentina. Known for producing popular red wine grapes like Cabernet Sauvignon and Malbec, the countries' vineyards suffered from unusually heavy rain caused by the El Niño climate pattern. World famous wine producers like South Africa and France also took big hits from nasty weather. But increases in other major countries like Australia, the U.S. and Spain are expected to offset some of the damage. The decline in global production is set to make this year the worst since 2012. The drop that year helped contribute to a shortfall of nearly 300 million cases of wine, according to analysts at Morgan Stanley. It's unclear whether wine drinkers will face a similar shortage this time around. The OIV says it's too early to give definitive figures on wine consumption this year, but it is expected to rise from 2015. Wine producers and sellers often keep stocks of bottles in reserve in case of supply problems.